Uhh...guys? This photo reveals A LOT. Fans are getting into full Riverdale season 2 mode, but that doesn't mean we've run out of time to analyse every post coming from the official Riverdale channels. Fair warning, there WILL be season 1 spoilers ahead. You've been warned. 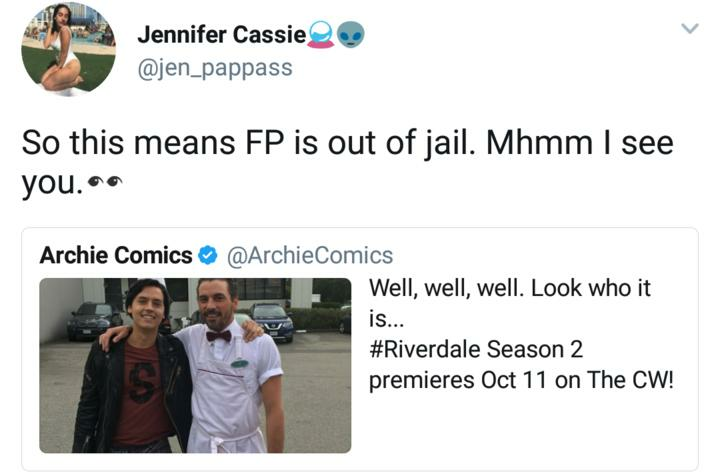 When we last left the Riverdale gang, FP Jones was in jail facing charges of evidence tampering in the Jason Blossom murder case. Jughead was getting ready to move schools and fielding a pretty lucrative offer from the Southside Serpents. 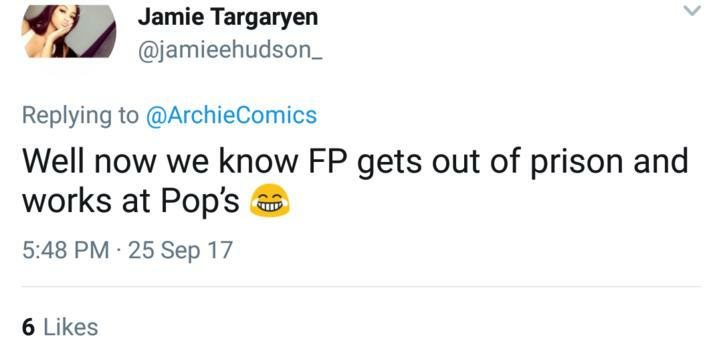 Things are all shook up for the Jones', so it makes perfect sense for the official Archie comics socials to tease the big changes in store for them in season 2. Here are the boys looking all moody~ and serpent-y. Aaaand, another one where FP looks ready to start his shift at Pop's Diner. But, WAIT. Doesn't this ruin the suspense of wondering whether FP is going to be all right? As far as we know, FP is wasting away in a holding cell. But, according to this, he's actually gainfully employed and lookin' good. People pointed out that this photo was basically a spoiler. 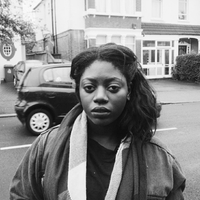 Yeah, who knew that a single photo could reveal SO much? Alternatively, Jughead could be dreaming about his dad wearing the uniform or letting his imagination run wild. It would be just like Riverdale writers to fake us out like this. We might have to wait until the season drops on October 11 to get all the juicy details, but my money is on FP Jones flipping a mean burger by episode 3.